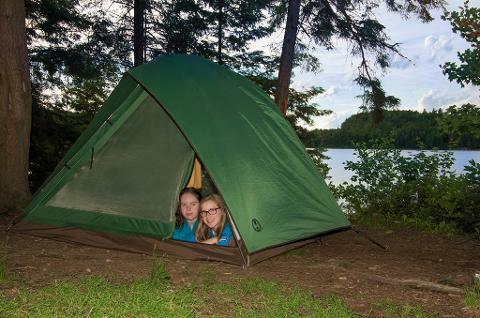 These Algonquin Park canoe trips are perfect for people on a tight schedule or a tight budget, but who still want an introduction into wilderness camping. We provide all food, permits, a knowledgeable guide, and all equipment (except personal items like sleeping bags, flashlights – a packing check list is provided). We can even provide transportation from Toronto as an option..
Pickup at Finch Subway Station in Toronto (optional – you can drive yourself to Algonquin Park). We meet at 1pm at the Permit Office at Rock Lake in Algonquin Park. Before we start your guide will instruct everyone on the necessary skills and techniques for canoeing. With your “Expedition weight” kevlar canoes we will paddle into one of the interior lakes of Algonquin Park (Pen Lake). While kevlar canoes are much more fragile than other canoes, requiring you to be careful around rocks, you will appreciate their relative lightness on portages and their speed in the water. This differentiates Call Of The Wild from other canoe tripping companies. Our canoes are much more expensive and fragile, but much lighter and faster than the more durable whitewater canoes they use. At the end of this three day canoe trip you won’t be an expert but you will know how to pack and steer a canoe. After a three hour paddle (including a 300m portage) you will arrive at your wilderness camp. Since this is a true interior wilderness camp you will have to bring everything with you in the canoes, including the tents. Once you establish camp, with the help of your experienced guide, you are free to explore the lake we are on. There are several large rapids that were once used as log chutes that are quite interesting. Also, in this area it is quite common to see moose grazing by the edge of the lake – we have seen over a half dozen moose in a two day period here! Dinner will consist of fresh food, prepared on site, and enjoyed by the side of a blazing campfire! Afterwards, you can sit and watch the Milky Way rise slowly above your heads. The sky is so clear in Algonquin Park that you can even count satellites passing by. And if you’re really lucky you may even hear wolves howling in the distance. This is real Canadian camping! Today is a day of exploration. You can spend it exploring the lake you are on, by canoe, looking for moose, or perhaps do another portage and canoe up a meandering river. 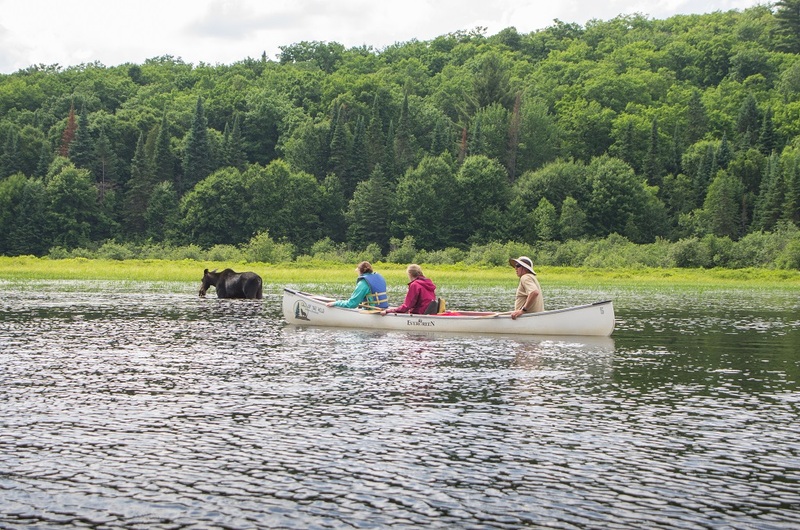 If you decide to try another lake one option is to do a short portage past an old dam used for logging, and then canoe the slow moving waters of the South Madawaska River. Since you will have to get out of our canoes to pull them over several beaver dams be sure to bring shoes or sandals for the water! Depending on where you establish your base camp, another option would be to canoe half way down the lake and then do a couple of portages, ending with a 1.7 km hike to Welcome Lake. This is one of the prettiest lakes in Algonquin Park, with a nice sandy beach. Perfect for picnic destination on a sunny day. After an early morning breakfast you pack up camp, load the canoes, and start the paddle home. The early start is a great opportunity to see moose or deer (if you are lucky) coming to the lake shore to drink. You will be backtracking your route through two lakes and one portage, but everything looks different in the opposite direction! Depending on weather and wave conditions you will stop at a cliff face where we will show you some ancient pictographs painted by the Natives centuries ago. You will get back to our starting point on Rock Lake at about 11 am. If you chose the optional transportation then you will be dropped off at Finch subway station in Toronto at about 4 pm.